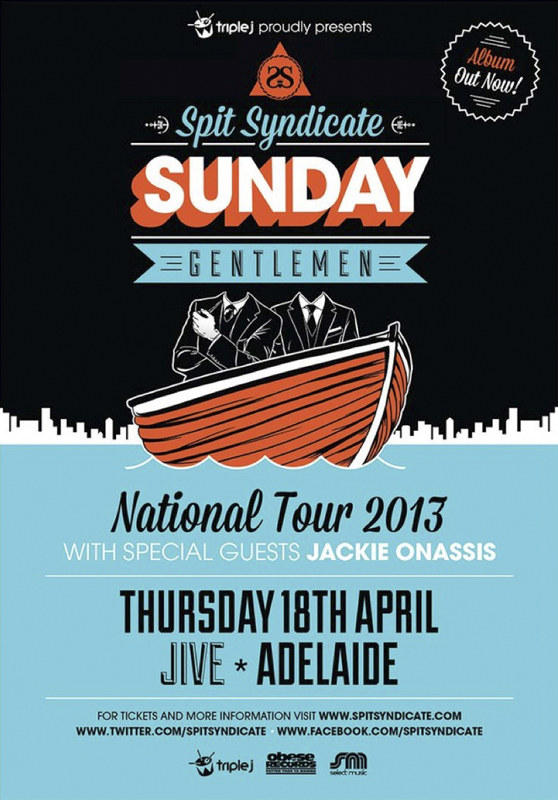 The boys from Spit Syndicate have been touring the country following the release of their third album, Sunday Gentlemen, and this Thursday is Adelaide’s turn. Fellow One Day Crew members Jackie Onassis are joining the SS for the huge 20 date tour which hits Jive Bar on the 18th. With Spit Syndicate’s singles Beauty In The Bricks and Folly getting a lot of JJJ love, as well as Jackie Onassis’s single Crystal Balling being on high rotation for many months, and their new single from their Holiday EP, Smoke Trails being added a few weeks ago the Sunday Gentlemen tour is no doubt going to be epic. 2013 is set to be a massive year for these boys from the inner west of Sydney, with both acts also being announced as part of the huge Come Together line up in June. Joining them in Adelaide will be our very own Koolta, winner of the 2011 Hilltop Hoods Initiative. With tickets still available, we don’t know what else you’d rather be doing on a Thursday night in Adelaide. Go here to get them. Spit Syndicate are also playing as a part of the Movement Festival alongside acts like Nas, Bliss N Eso, Joey Badass, Chiddy Bang, Diafrix and Iggy Azalea. Jimmy Nice chatted to us a few weeks ago about Sunday Gentlemen and the Movement festival tour, peep that here.